HazmatU is an e-learning program that was created to ensure employees and students in the automotive industry have a clear and accurate understanding of HazMat (Hazardous Materials) shipping regulations. Our program helps dealerships and facilities prevent violations and create a safer and healthier work environment for employees. HazmatU will help you fulfill the DOT’s Hazardous Materials Training requirements. It will also keep you up to date with the many changes to these regulations. 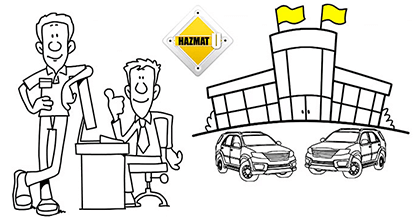 Why is HazmatU Critical to Your Dealership?